The mill department is comprised of 3 departments. 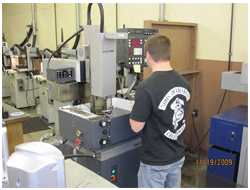 For over 3 decades Pennco has been known as a leader of our industry that specializes in close tolerance form grinding of steel and carbide with more that 60% of our current business in carbide die tooling. In 1998 a CNC Hole Drilling department was added to support our WEDM’s and other customers requiring small holes. State of the art climate controlled Wire EDM department with separate chiller room. Our EDM department utilizes carbide circuit technology that burns both carbide and steel to extremely fine finish while holding very close tolerances. 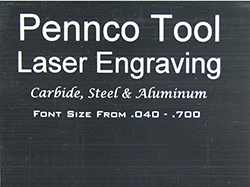 Pennco provides custom laser engraving to all manufactured or customer provided parts including the following applications; custom serialization, data matrix, geometric shapes, text in any designated path (arced, circular, diagonal, etc. ), date and time in standard as well as custom format.